The company now has over C$3.2 million in the treasury and is fully funded for upcoming diamond drill programs at its flagship Moore uranium project located on the southeast side of the Athabasca Basin. Skyharbour Resources (TSXV:SYH,OTCQB:SYHBF) has reported the closing of a non-brokered private placement for aggregate gross proceeds of approx. C$2.6 million. The company now has over C$3.2 million in the treasury and is fully funded for upcoming diamond drill programs at its flagship Moore uranium project located on the southeast side of the Athabasca Basin. Skyharbour is an uranium and thorium exploration company, currently engaged in projects in the Athabasca Basin. The financing consisted of 3,712,582 units at a price of C$0.40 per unit as well as 2,462,256 flow-through units at a price of C$0.45 per FT unit for combined total gross proceeds of C$2,593,050. Each unit is comprised of one common share and one warrant. Each whole warrant will entitle the holder to purchase one additional common share for two years at a price of C$0.60 each. Each FT unit will be comprised of one flow-through common share and one-half of one warrant. Each whole warrant will entitle the holder to purchase one additional common share for two years at a price of C$0.60 each. In connection with the financing, Skyharbour issued a total of 79,097 warrants to finders who introduced certain subscribers to the private placement. Each finder’s warrant will entitle the finder to purchase one additional common share for two years at a price of C$0.60 per common share. The company also paid to finders a total of C$40,059 in cash fees associated with this financing. The units, FT units and warrants issued under the private placement and any shares issued pursuant to the exercise of the warrants and finder’s warrants are subject to a four month and one day hold period, expiring on December 3rd, 2018, under applicable securities laws and imposed by the TSX Venture Exchange. “We are pleased to close this financing with several new institutional and strategic investors. 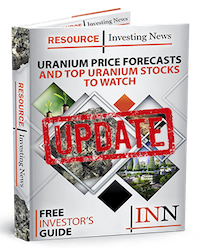 The company is well positioned financially with over C$3.2 million in its treasury to fund the planned and upcoming exploration programs at its flagship Moore uranium project including the summer 2018 drill program slated to commence this month. Given the previously reported high grade drill results from our previous programs as well as new and refined targets in the underlying basement rock, the company is excited to recommence drilling. Skyharbour will also benefit from news flow from upcoming exploration programs being planned with strategic partners Orano Canada Inc. and Azincourt at the Preston Uranium project. The company continues to execute on its business model by adding value to its project base in the Athabasca Basin through focused mineral exploration at its flagship Moore uranium project, as well as utilizing the prospect generator model to advance its other projects with strategic partners,” said the company’s president and CEO, Jordan Trimble.